Sixty five young people, among over 600 applicants, were selected for Reach A Hand Uganda’s annual Peer Educators Academy #PEA2015. The one month training that was hosted at Victoria University is built on a module of comprehensive sexual and reproductive health and rights information and life skill development. 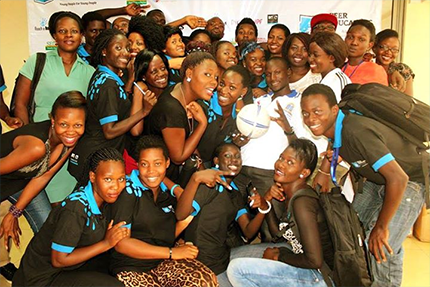 Our peer educator’s programme is one of the largest youth health and life skill development forum in the region. The young people completed the one month training in key topic areas, including the importance of peer education; changing high-risk behaviors; listening, responding, referral and intervention skills; inclusivity; programming and presentation skills; self-care; and group development. They have become good sexual and reproductive health and rights advocates through online platforms like social media and blogs. You can follow some of the conversions using the hashtag #PEA2015. Among the participants this year were young people from our partner organisations like Miss Uganda Foundation, including Miss Uganda- Leah Kalanguka, our own cultural Icons and musicians like Lydia Jasmine, Ray Signature, and Maurice Hassa. The youth had a great time interacting with these icons. They were pleasantly surprised by the engaging methods used to drive these messages home, like drama, videos, mentorship, group projects, organisations visits and demonstrations. They heard from inspirational speakers from all spheres, like Major Ruranga Rubaramira, Dr. Naboth Cole, Nana Kagga, and Kin Kaliisa. They attended summits, Co-hosted on the Mix-Up show on NBS TV, to teach others what they learnt. The one month training of the academy programme was concluded with an award ceremony hosted at Seven Trees Wampewo in Kampala to appreciate the peers for participating in the 2015 training and celebrate the great work of the 2014 class. The ceremony was attended by Mr. Kin Kariisa Chairperson Kin Group as the chief guest, Dr. Stephen VC Victoria University, Maj Rubaramira Ruranga and our partners from the SRHR Alliance. The peer educators were awarded certificates in the presence of their parents. These trained peer educators will be distributed in over 25 different schools we work with to influence a positive change among fellow youth in these communities, mainly from the SRHR clubs. “The Peer Education course benefits not only the young people enrolled, but the students in the different schools they will be placed in. Regardless of their academic background, the young people taking this class gain knowledge and skills they’ll use throughout their lives and careers. By sharing this learning with others, they’re helping create a healthier, more informed community.” Humphrey Nabimanya, Founder and Team Leader, Reach a Hand Uganda (RAHU). The 2015 Peer Educators’ Academy could not have possible without the selfless support from our partners- MTV Staying Alive Foundation, Rutgers WFP, Segal Family Foundation, Victoria University, and NBS TV.